We’ve covered a wide range of topics related to Full Cycle Recruitment processes which have been well received by the WhatsApp group members and followers alike. The out pour of responses we’ve received clearly indicates the popularity of these WhatsApp groups. What will be the expectations from the employer from a recruiter in 2017? Learn advanced methods of Recruiting via Social Media platforms which may involve costs but are surely worth a try. Utilizing the right opportunity from the employer and hitting the right candidate at the right place makes a Recruiter’s life easier and employee oriented. While we have access to lot of newer Sourcing tools today (which is Fantastic); Selling is a Skill which will continue to remain the key factor. Upcoming and existing competition around technology hiring’s etc. Also be involved in the business teams E.g. Be the Host of or attend a niche tech-talk programs with industry peers at a high tea. Now don’t you agree with us when we conclude with the statement that we’ve received quite a lot of insights that are worth a try? If you’ve read this far; we’re sure that you’ve found something interesting and even added to your knowledge by just being a passive learner. Well you need to come out of your comfort zone and move ahead. How? By becoming an active learner and to realise the difference in yourself and know what you’ve accomplished and are capable of. Send us a DM to @SourcingAdda with your contact and location details and our representative will get back to you. In conclusion we’d just like to end with a quote that summarises the conversation best. As Greg Savage has put it perfectly, “Sourcing is a Science, while Persuasion is an Art” and don’t forget to visit – http://tascon.in to get more information about our upcoming most awaited annual event #TASCON17 and to gain a clear idea about our past events of #TASCON15 & 16. We’ve covered a whole range of topics related to the full cycle of Recruitment and dealing with the various processes involved right from the immediate contact stage and on-boarding stage. But have you considered the Role of HR in Company Compliances? It is necessary to go back to the books to find out the aspects that one needs to consider and pay attention to the motivational factors. Compliances are hygiene i.e. a set of rules and regulations that all parties involved need to know and follow for instance, the maternity leaves are hygiene but you can add more work from home and other privileges to make it a motivational factor. Compliances are defined by senior HR bodies / HR directors for smooth functioning of the organization. The role of HR persons is to help in developing a uniform implementation of the same and making everyone aware about the compliances. Responsibility of Compliances lies with whom? 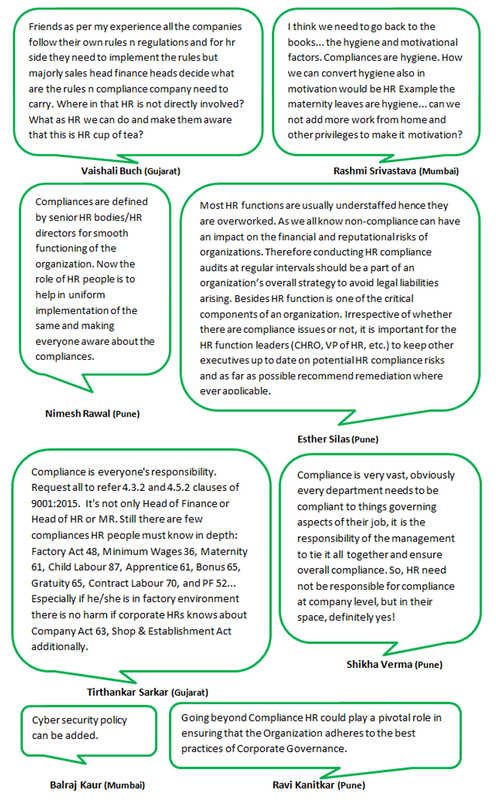 Compliance is everyone’s responsibility besides it’s not only for the Head of Finance or Head of HR or MR.
Who should view the Compliances? When to conduct Compliance Audits? Therefore conducting HR compliance audits at regular intervals should be a part of an organization’s overall strategy to avoid legal liabilities arising. Going beyond Compliance HR could play a pivotal role in ensuring that the Organization adheres to the best practices of Corporate Governance. Send us a DM on Twitter to @SourcingAdda with your contact no. and location and one of our representatives will get in touch with you. We’ve spoken so much about catching the needle in the haystack talent and also gone over the aspects of on-boarding Candidates. We’ve discussed the importance of joining goodies and the role it plays in retaining them. But have you ever thought about the company’s hiring policies especially when we’re dealing with relative hires? 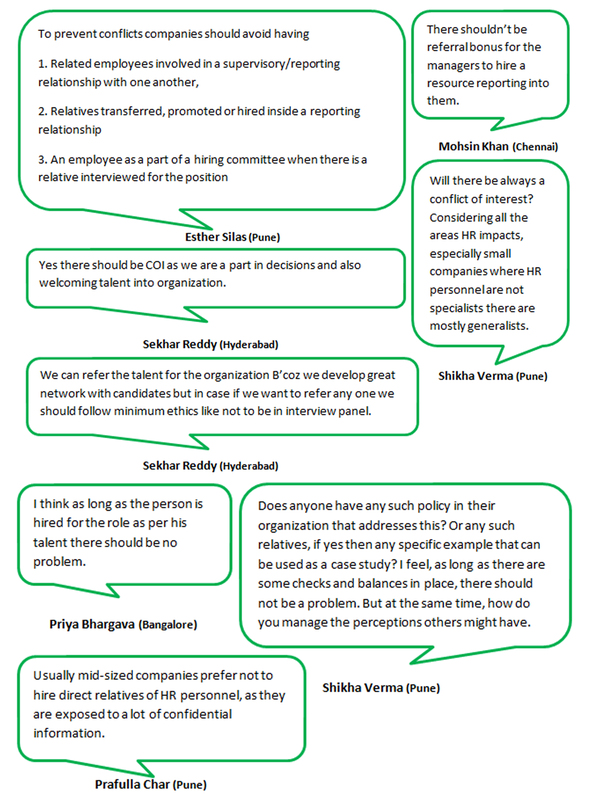 If you haven’t yet thought about it then here’s a chance to begin by reviewing the WhatsApp Group chat that we had on, “What are the policies governing the Employment of a HR staff relative in the same company?” upon the suggestion of our Pune group member Shikha. But before we get in to that be sure to view the key take a ways right after. How to Prevent Conflicts of Interest (COI) due to Relative hires? Usually mid-sized companies prefer not to hire direct relatives of HR personnel due to the exposure to confidential information. Have some checks and balances in place and make sure a person is hired for the role as per their talent. Well now you know what aspects you need to bear in mind to avoid COI from arising entirely. As long as these measures are put in place and followed; it will definitely prevent COI and facilitate performance. In order for this to work you need to be absolutely sure that the Talent you’re hiring isn’t related to the decision makers. In the event of a situation where you do have a Talent i.e. related to your HR personnel then be sure to follow the above mentioned ethics to avoid COI altogether.